this time, I wanted to choose more as all your cards were fantastic..
Well done girls, Your cards are fantastic! THAT'S 18 that's you Chrissie you wooo hooo!! and don't forget its a brilliant prize and a GD spot up for Grabs this time too! Thank you for joining in with last week's challenge, and don't forget to pop back later to find out who's won the Simon Says Stamp voucher and Samantha's top 3. 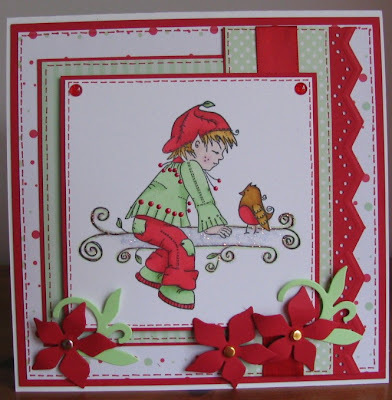 Thank you to our fab guest Designer Jane ... her cards have been gorgeous. On to this week's challenge .. we are up to E and for this challenge we would like you to use elves or fairy folk (we are being flexible and allowing WOJ gnomes, and basically anything fairy folk like and Christmasy!) on your card, and the colour combination red and green. 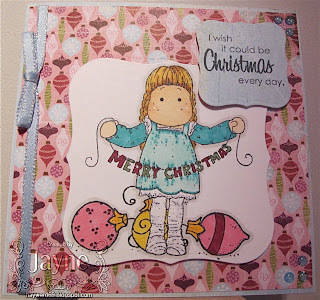 We are being sponsored by our lovely DT member Lacey and her shop Stamp and Create, and you can win the gorgeous Whiff of Joy stamp Whiff in Stocking that Samantha has used. 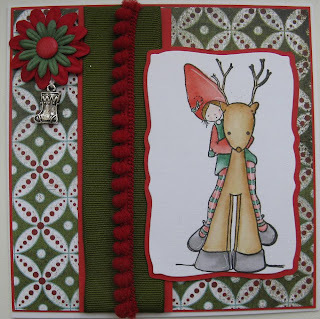 Stamp and Create is an on-line store carrying many popular brands of stamps, paper, and embellishments including: Wags ‘n Whiskers Rubber Stamps, High Hopes Stamps, Kraftin’ Kimmie Stamps, Whiff of Joy, Stampavie, Penny Black, The Greeting Farm, Basic Grey, 7 Gypsies, Shimmerz, Nestabilities (always 20% off!! ), lace, charms and more!! Make sure to check out the Christmas section a well. 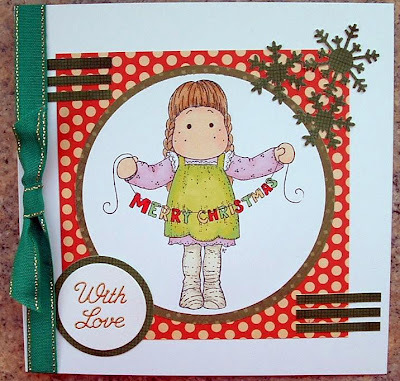 Lacey has supplied some of the DT with some gorgeous ribbons and charms to use on their cards. 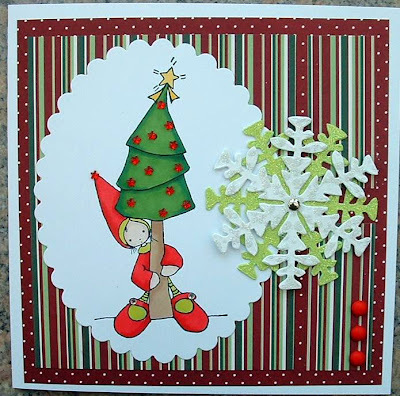 We look forward to seeing your Elf and friend creations! It was a really hard task picking a top 3 this time, all your cards were fabulous and I would have loved to pick all of you. Can you all email us (abcchristmaschallenge@hotmail.co.uk) for your blinkies and how to claim your prize. Don't forget to join in with the D challenge. Firstly, we'd like to say a HUGE 'thank you' to all of you who took the time to enter our DT call. We really enjoyed looking at your fabulous cards, and having a nosey around your blogs...you gave us a very difficult decision! Congratulations ladies...welcome to the ABC Christmas Challenge family! Please don't feel disheartened if you weren't chosen this time...we will be having regular guest designers chosen from entries to our challenges. Firstly, I Samantha would like to thank all of you that entered challenge C for Candy! Don't forget to come back later to see who has won the fabulous prize, and the Top 3 spots. We will also announce who will be our new DT members too! I am really so excited to WHY? just wish I could win it myself! te hhehee! 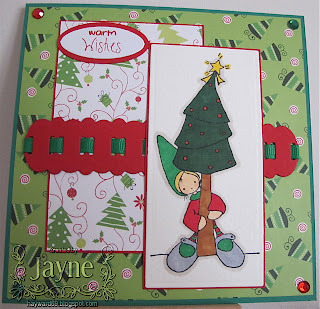 you don't have to use a stamp or just make your project a card! here are a couple of Decoration made by our very own Helen! So, spread the word and we look forward to seeing your projects this time! Your project can be a anything you like and to help inspire you here are the DT projects. We are really please Jane has joined us for the next 2 challenges. She has made this really cute card! I was gonna say what a cracking card! No pun intended (crackling) haha. I love it well done Jane!